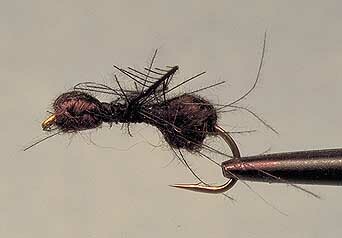 Ants are one of the most ubiquitous of the terrestrial insects for trout fishermen. As they can be fished from the middle of summer through fall, it is always worth trying an ant pattern when everything else seems to be failing. As the early summer hatches complete their cycles the terrestrials proportionately become a greater part of the trout's diet. Ants make up a useful proportion of this food source. Ants are most active in the heat of the day. They are less likely to be about in the cool of the morning or the evening. If you studied an ant colony as a child, you would remember that they are highly organized and follow a strict regimen. In the evenings the ant gather in the nest to increase communal warmth. In the day the worker ants tend to move about collecting food for the colony. 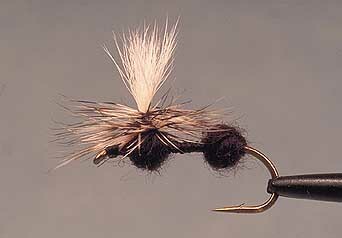 At certain times, the breeding ants will swarm creating clouds of winged ants which can fall conveniently on the water for the waiting trout. Thus ants will come to be on the water either because they have fallen from trees and bushes close to the water, or where they have swarmed and fallen in. Ants do not float for long on the water. They tend to sit low in the water until the air which supports them leaves the body or their trachea fills with water. The ant then sinks. This means that the pattern to use should sit low in the water rather than perched on the top. The helpless ant caught in the surface film will be subject to the flow of the current. Therefore, look for an area where debris will tend to drift. But remember that the struggles will cause the ant to sink so that the choice of fly will be important as will the control of the fly on the water. Ants will generally be fished dry. When casting an ant pattern, don't be fussed if the fly hits the water noisily. Ants will either fall into the water from the bank or overhanging shrubs and trees or be part of a swarm which hits the water. The ant will float low in the water and tend to sink after a time. Therefore, it might be worth permitting the ant to sink and see if the feeding trout is interested. Hence carry a pattern which will sink gently beneath the surface. In addition, broken water will cause an ant to sink and once or twice float up a little if there is enough residual air in the insect. As the ant will be fished later in the season by then most of the trout will have been treated to a plethora of flies and therefore be well educated. It is more likely that the trout will be leader shy. As the ant will be trapped in the surface film the trout will be able to take its time feeding and hence will be able to inspect the food. If the trout is leader shy, it will be best to fish across the water flow to attempt to keep the leader from drifting into the vision of the waiting trout before the fly passes the same area. 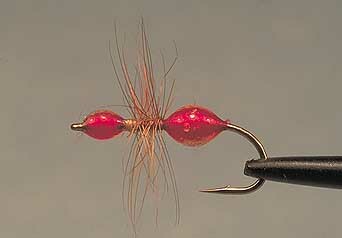 The lighter the tippet and the freer the drift the better the results. High sticking will limit drag. Drift the fly where the debris will tend to drift. As the ant will tend to sink, do not grease the line to the fly to help it sit up in the water. It is preferable to drift the fly into the fishes view, then let it drift out before lifting the fly off the water before casting again. Generally black or cinnamon patterns in sizes ranging from #16 to #20. Real ants are covered with minute bristles that have a tendency to trap numerous small bubbles of air. 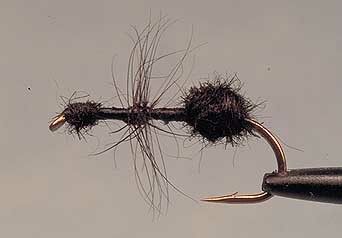 An ant that looks black very often is sparkly silver from a trout’s view. Foam ants look interesting because the tiny pockets in the foam hold glistening bubbles. Unfortunately foam ants tend to be high floaters where natural ants are low floaters and sink rapidly. Carry a range of ant patterns and be prepared to experiment a little. Trout are opportunistic feeders and therefore in the right circumstance luck will play a significant role when all of your experience and book learning has been unsuccessfully exhausted.